For some of our test flights, we use Propeller AeroPoints for high-precision GPS targets. These solar powered panels can get GPS accuracy up to 0.06’, so they are a huge benefit on a number of projects. 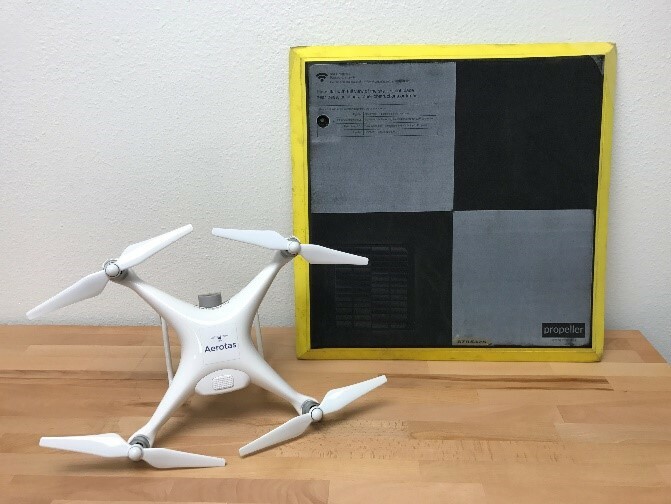 In order to use them, you simply lay the panels out throughout a project site, fly your drone, then pick them up afterwards. However, at $600 each, they can be quite expensive. When we went to pick them all up afterwards, we discovered that one was missing, and just assumed someone had picked it up and wandered off with it. After 30 minutes of searching the surrounding area, we left the site empty handed. Back in the office, we began the process of filing a police report to say our equipment was stolen, but we decided to go through all the drone data and see if we got lucky and caught the picture who took it. Going through the first set of photos, we were able to clearly see the panel on the ground. The next pass of the drone, taken about two minutes later, clearly showed that the panel was gone. But upon closer inspection, the bright safety yellow color of the Propeller AeroPoint stood out in the stake bed of the maintenance truck at the bottom of the photo. We had evidence of who took our equipment! Now came the real challenge of tracking down exactly who this was. Because of the location of the property, we had reason to believe that this was a city-owned vehicle. But after a few dozen phone calls, a few voicemails, and a few less than helpful city employees, we began to get frustrated again and started to think our precious equipment might have already made its way to a dump. But all of that changed when I got ahold of Juan Lopez of the Santa Ana Parks Department. To say that Juan was helpful would be a complete understatement. 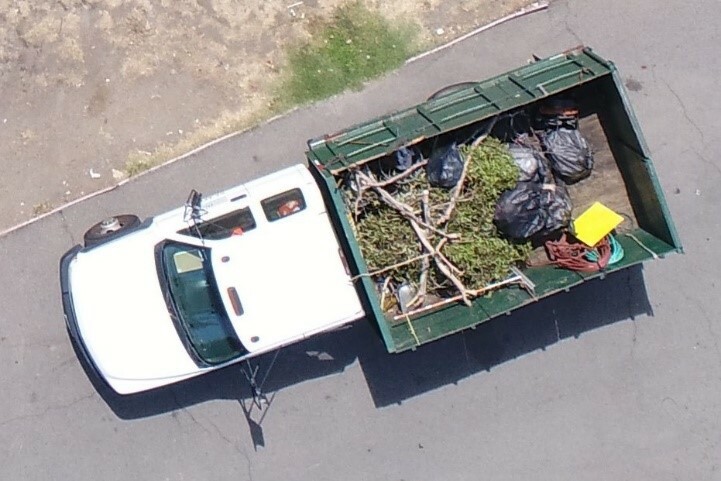 With our photo and description of the equipment, he was able to track down the city employee who was driving the truck and find out where the AeroPoint had gone. It turned out that the city employee was just trying to clean up the park, and mistakenly though the panel was garbage. After discovering that it had indeed been dumped into a dumpster, he helped to arrange for its recovery, going back into the dumpster to recover our equipment. The next morning, I got a phone call saying that our AeroPoint is ready for me to pick it up. A 10 minute drive later, and the equipment is back in our hands. So what this goes to show you is that drone data can often pay off in unexpected ways. One of the substantial benefits of a drone is that it automatically collects more data than you need, whether that is survey data, or a lost AeroPoint. If it weren’t for the complete record of the site that the drone recorded, we would have had no way of knowing where our equipment had gone, and we would be out $600. However, a special thank you goes out to Juan Lopez of the Santa Ana Parks department. His help went far above what was required to help a local small business from losing our equipment. Thank you, Juan! Newer PostWho owns the air above your home?